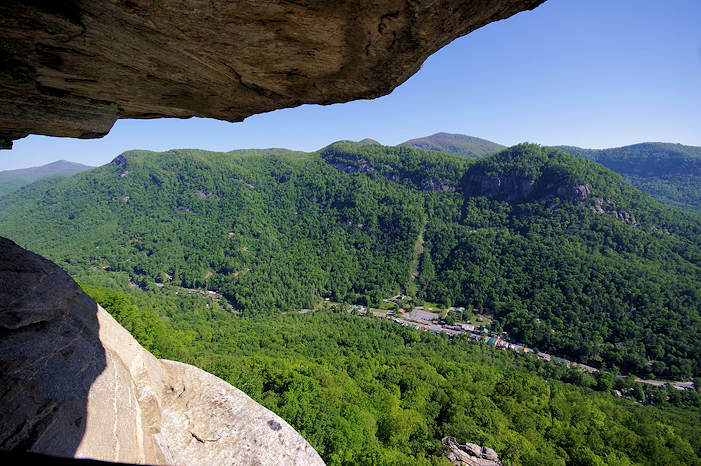 Experience the best of the North Carolina mountains in one place at Chimney Rock at Chimney Rock State Park, just 25 miles from Asheville in the Village of Chimney Rock and Rutherford County. 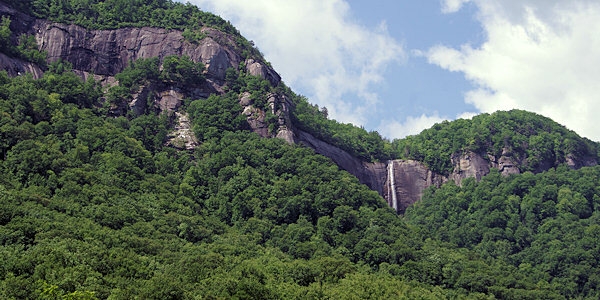 For the last 100+ years, tourists have journeyed to see this 500-million-year-old towering monolith, and the park's "one-stop shopping" for what the mountains are loved for: dramatic scenery, exhilarating hiking trails, rare plants, native wildlife and one of North Carolina's highest waterfalls (featured in the movie The Last of the Mohicans). The elevator is repaired and working again! Top parking lot open after landslide repairs. The Skyline Trail is open! Read more. 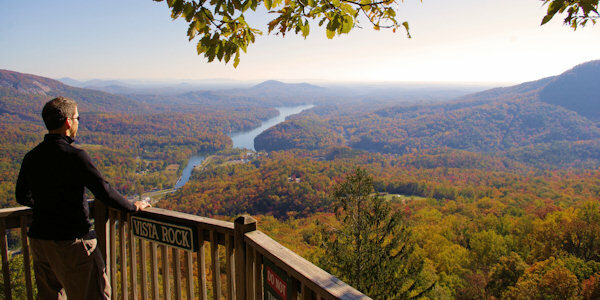 Top of the Rock: To reach the top of Chimney Rock, drive up a three-mile winding road to a large parking area. Then climb 500 steps to the chimney or ride the elevator and climb a short staircase to the top. 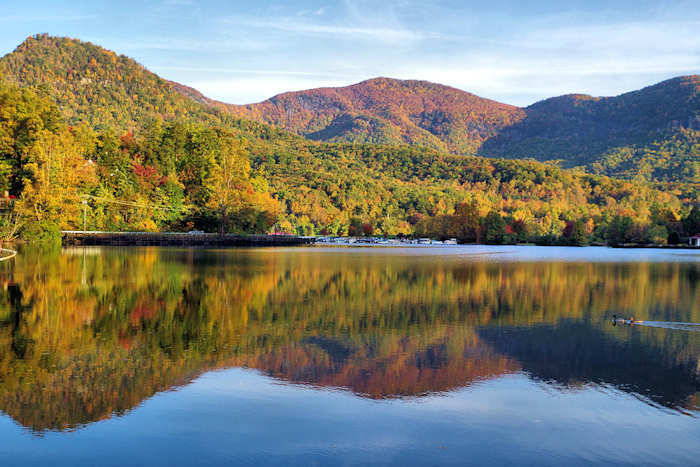 On a clear day, enjoy 75-mile views overlooking Lake Lure and the Hickory Nut Gorge. Hickory Nut Falls Trail: This "easy" trail is a wide, gently rolling path to the bottom of the 404-ft. Hickory Nut Falls waterfall. The 1.5-mile round-trip trail is mostly wooded with just a few moderate uphill sections. The best trail for wildflowers, birding and rhododendron. It's shaded, so a great option on a hot day. See our Hickory Nut Falls Guide. The Outcroppings: Follow this network of stairs from the parking area to the Chimney. Along the way, check out the views from Vista Rock. Strenuous with 500 steps, but all ages and fitness levels can enjoy the challenge with many places to stop along the way. The Subway, Grotto and Pulpit Rock, long-time popular features on the Outcroppings trail at Chimney Rock at Chimney Rock State Park, reopened in 2015 after being closed since 2008. Exclamation Point: At the staircase leading up to the Chimney, find the beginning of this trail. After climbing quite a few stairs, the trail levels out as you walk along the cliff with dramatic views. Stop at the Opera Box for great views of the Chimney and Lake Lure and continue up to see the Devil's Head and end at Exclamation Point (2,480 ft.), for nice gorge views. Skyline Trail: This new trail begins at Exclamation Point and continues for 1.1 miles atop the ridge. Read more. Four Seasons Trail: Get your heart pumping on this 6/10-mile trail with a 400-ft. elevation gain. The trail winds through hardwood forest, rhododendron and mountain laurel thickets and abundant wildflowers as well as rare and indigenous plants, some species not found along the Park's other trails. Great Woodland Adventure: This whimsical trail is perfect for kids and kids-at-heart. Twelve discovery stations along the half-mile loop give a peak into the lives of the many animals that call the Park home. All sculptures were handcrafted by Western North Carolina artisans. Rumbling Bald Trail: This 1.5-mile loop trail in Chimney Rock State Park has a separate parking area about 2 miles from the main Chimney Rock entrance. Read more. Birding: Chimney Rock is an official site on the NC Birding Trail and offers birding walks and programs throughout. Don't forget to bring your binoculars for a chance to see the amazing acrobatics of a Peregrine Falcon high above the Gorge, slicing through the air at more than 60 mph or swooping on smaller birds in flight at the incredible diving speed of 200 mph. The Park hosts its Annual Flock to the Rock in late September featuring birding workshops, guided walks and other programs at no additional cost. Read about Birding Weekend! Dining and Shopping: The Village of Chimney Rock, located at the base of the park, has a variety of cute shops and local restaurants. The primary gift shop in the Park is Cliff Dwellers Gifts, and Chimney Rock operates the Old Rock Cafe at the Park entrance. You can get a picnic (Hiker's Lunch) from Old Rock Cafe and picnic along a trail. There are several picnic tables, including one at the base of Hickory Nut Falls and one at Exclamation Point. Special Events: Find events almost every week including many guided hikes. See the Chimney Rock Events Calendar for the latest. Fall Color: The grand autumn color show peaks in early November this year, later than the rest of the mountains since this is a lower elevation. See our Fall Foliage Guide for the full scoop. Rock Climbing: Read more about rock climbing with an experienced guide. 1. Take your time. Plan to spend at least a half day. 2. Wear very comfortable walking shoes. 3. Arrive early (8:30 AM) to beat the crowds on weekends and holidays (and beat the heat in the summer). Saturdays during the summer are the busiest days. 4. Study the map given to you with your ticket. You will miss much if you just go to the top of the Chimney and depart. 5. Hit the trails! 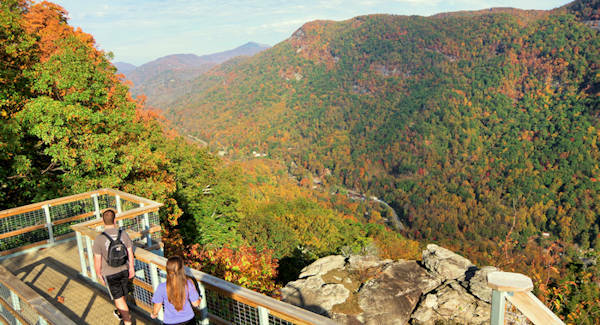 Discover North Carolina mountain hiking trails for all fitness levels. Remember to carry water with you. 6. There are a number of romantic spots along the trails, including the Opera Box the overlooks the Chimney (best vista in the park). 7. Pets are welcome in the Park but must be kept on leash at all times. 8. Restrooms are located in the Sky Lounge, in the Meadows near the ticket center and the parking lot at the base of the Chimney. There are no restrooms along the hiking trails. 9. Stay in a cottage or cabin nearby. 10. 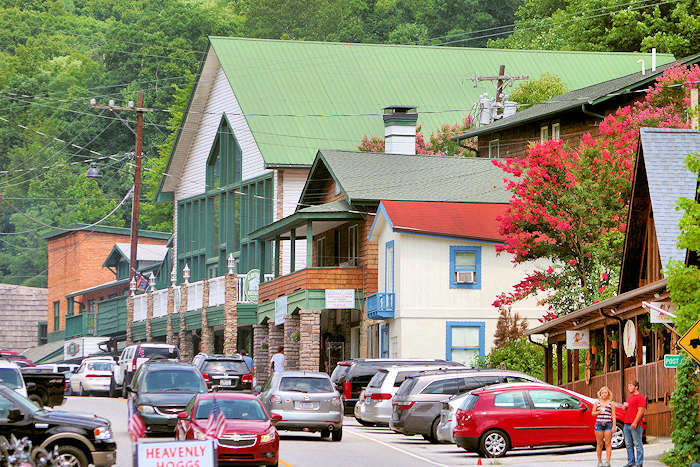 Stop in the Village of Chimney Rock to explore the cool shops and river boardwalk. For more information go to the Chimney Rock website. Chimney Rock is located 25 miles from downtown Asheville. Follow I-240 East to Exit #9, Highway 74A East to Bat Cave. Take 74A & Highway 64 to Chimney Rock Village, and the Park entrance is on the right. It's 17 miles east of Hendersonville via U.S. Highway 64. Street address for GPS: 431 Main St, Chimney Rock, NC. Adult admission $15, youth 5-15 $7, children free. January 1-March 9: Open daily 10 AM-4:30 PM. November 3-December 31: Open every day 8:30 AM-4:30 PM. Closed Thanksgiving & Christmas Days. Go to Chimney Rock Park to see if Greta the groundhog sees her shadow to predict an early spring or a long winter. Other activities for kids of all ages. 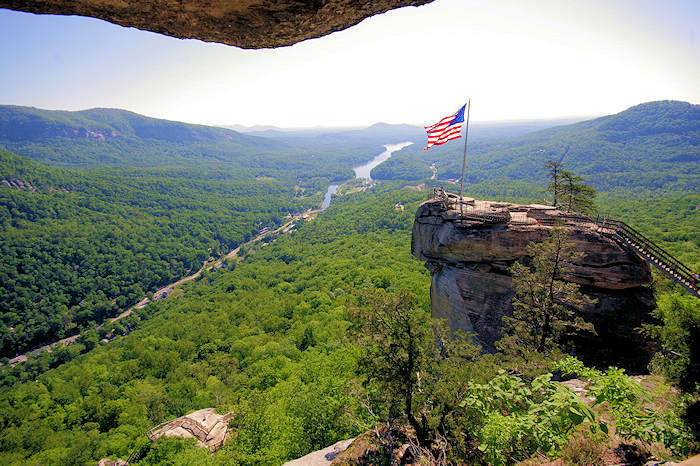 Celebrate Easter by watching the sun rise over Hickory Nut Gorge during the annual service atop Chimney Rock. Free admission. Watch Santa practice for his world-wide chimney-dropping tour on his "practice chimney," the 312 ft. tall Chimney Rock monolith. Included with park admission.